I drove back from Memphis the other day and had to stop at a berry farm…. was so excited that blackberries are coming in. I bought a bunch of them…. 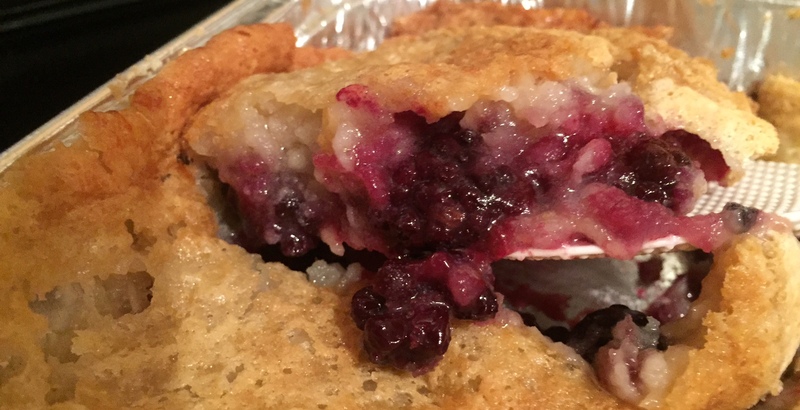 a couple of quarts thinking it was high time for blackberry cobbler and it really was! 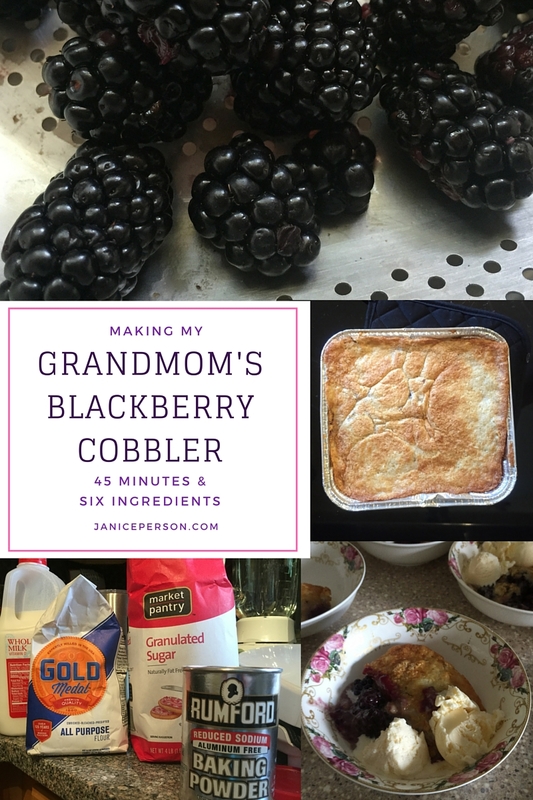 I had to get my grandmom’s blackberry cobbler recipe too! When I was a kid, my siblings and I would go to work with our mom in the summer now and then. Although it was sometimes just for a change of venue, we frequently went thinking about how many blackberries we could pick. And we’d have dreams of cobbler with dinner. Mom would make grandmom’s easy blackberry cobbler — she’s also called it a lazy pie at times. Being single, I rarely cook desserts but knowing I have a nephew around to eat lots of it, I decided full steam ahead! Got the last few things at the grocery Saturday so Sunday I got to making a couple — one for our house and another for friends. Here’s the recipe (according to mom & sisters). 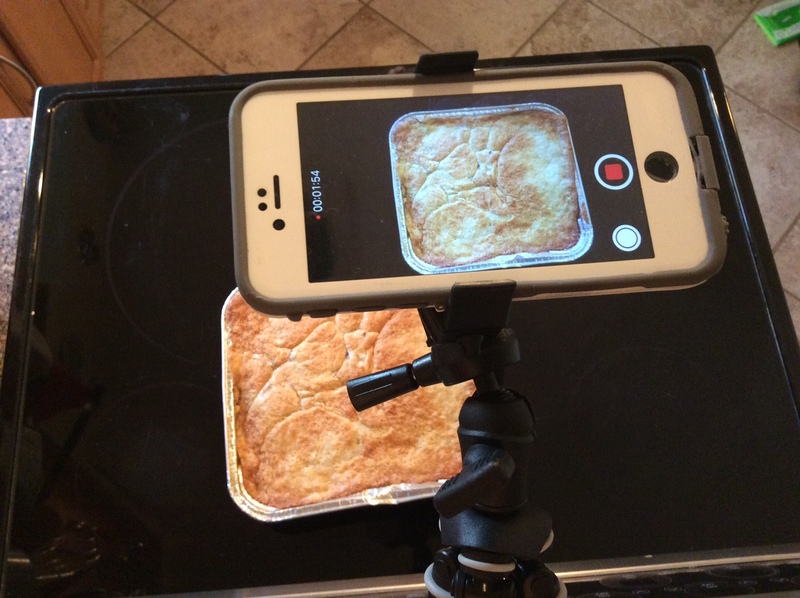 Melt a stick of butter in a brownie pan (9×9 or 8×8). Mix flour, sugar, baking powder & milk). Pour mixture on top of melted butter. Pour in two cups of berries. In May, one of the work trips I went on was the Food Wine Conference. One of the sessions I attended was “Moving Pictures: Video Workshop” sponsored by the Beef Checkoff. The team from Chez Us did a great job showing us how to take the fast-paced video tutorials that I see all the time in my Facebook feed. We made a yummy grilled steak salad and shot the video and we talked through editing. Janice – I love this; blackberry cobbler is one of my favorite desserts and one I definitely do not make enough during the summer! And I am thrilled that you made a video to go along with it. Thanks Denise! Appreciate the tips you guys gave me. I know I can get faster…. thought this worked out pretty well for a first time out! Sounds good and very easy to make.Could you use fresh cherries instead? Yes! Definitely! We do it with all sorts of fresh fruits — blackberries were our favorite but we did them with peaches, blueberries, ets. Some of them are firmer while others are a bit softer but cherries sound perfect!